HI Gang! It's been months and months (read a couple years) since I started my projects. I bought a new house and had lots of projects on the boards. I even bought a motorcycle this year which took lots of my time away too. But at the end of the day, I finally completed my modified HDTs. I decided to use a FE126E for the higher end and the same Silver Flute 8" for the lower. A few adjustments and away we went. I have to admit, these speakers really, really, really showed the weaknesses in my electronics. After a bit of tweaking and some new cables, i am extremely happy with them though. At first I had them out in the room and away from the corners. I also had them toed in a good bit. Both were mistakes. Putting them straight helped a lot with the imaging and front stage depth. I mean it helped a LOT too. Putting them closer to the corners brought the bass extension out tremendously too. I can actually listen to this sans subwoofer and I am really happy about that. To say what they did for the sound of my HT and movies would be difficult to describe. Everything is better lol. Very, very nice job indeed! You already know the next question!! Would that be "how do they sound?" Well, I want to take them up to Ziggy's house and see how they do with a Tori driving them really. I might also let him work a little magic on those fostex drivers if he's willing. The thing in my house is the weak link in my system currently. The SS receiver I am running them with is quiet which is good and they will get super loud before any sort of break up. In fact, I haven't been able to drive them to any break up at all. I had to leave the room from the sheer volume lol. They are absolutely amazing in the mid section of sound. Every vocal is crystal clear and all of the usual instrument sounds are precise and solid. The image is as good as I could have hoped for. With them away from the wall, the stage is pretty deep, but with them against the wall it is a bit two dimensional. Unfortunately, the sound is much better with them at the wall. They just don't produce anything below about 100hz out in the room. Next to the wall, they get down to around 60 or so, but they are still a bit thin without the sub. Now combined with the sub whoa! Just a whisker hair of the sub and the whole room is filled. It only takes a scratch of sound from it to fill in the bottom end and my sub only covers from 15hz up to about 65 so it is a really good blend. I really want to hear these on a warmer sounding amp and source. The sound is very solid and accurate. It isn't anywhere close to some of the things I have heard at Bob's house, but I am guessing there are a lot of factors to that. Room, Amp, Source etc. The bottom line is they sound at least 1000 times better than anything I have ever owned and I love them. They aren't fatiguing at all. I listened to them for hours saturday and never once wanted to change the music or the volume levels. That in itself is a true accomplishment. They aren't as "effortless" as the radials or Bob's Fugly's, but then I have never heard anything better personally. I suppose I have a goal where the bar was set and I will keep trying to reach it lol. Very nice job indeed! I like the different approach that you took on the style. That makes them unique and special. Just talking to Bob about them. We already know one quick and easy mod to those Fostex drivers which will make a profound difference in their performance. You will have to get with Bob about the details as it is well worth your time to do so. I wish that my cabinets had your characteristics, as my problem with these speakers is just the opposite. I have so much bass that I have had to find ways to reduce well over half what these put out in my room. This set of speakers has been the most troublesome of all when it comes to bass issues. The MK2's will never be as clean and accurate as the original HDT models with the alternate passives and DFR8 drivers. I can assure you that I want to stay well away from the corners with my set! I had to build a massive 63 Hz resonator to tame the rooms response down to be acceptable with these speakers. The bass is powerful and easily over driven with these in my room. It took the resonator and some very large quantities of room treatments throughout to make the MK2'S respond favorably. The room is large with a good deal of space all around. I guess that your situation is a blessing really, as you would not want my issues with the MK2's. It is far easier to create bass than to reduce it in a satisfactory way. All of my other speakers work superbly in this room with outstanding results. If you could hear the Kadence models in my current room set-up, it would raise both of your eyebrows with a twitch or two. A very good example of how things sound when everything comes together just right. Again, good work. I hope that you get much enjoyment out of them. It is always nice to build something for yourself to be proud of. A compliment from you is a pretty big accomplishment in my book. I have talked to Bob about some of the Fostex mods and I will likely take on one or two myself. I am afraid I might mess up and take away a bit of the magic in either the midrange or drop some of the high extension by messing with them. I wanted to make certain of what to expect from the mods before I actually started surgery. I am surprised that these produced so little bass to be honest. I think it is possibly due to the damping I put in the enclosure. I put some behind the fostex drivers and stopped just above the SF. I didn't do the top of the cab. I also put the egg crate material in the averaging chamber. Other than that, I can't really think of a reason for these to be so light in the bottom end unless it is my electronics. That is highly possible though considering what I am using. I am going to connect them to my SI amp next and run directly from my CD player to see if the receiver is set up wrong somehow. It looks right as far as I can tell, but you never know. I was also wondering if the SF drivers needed some break in time. One of them has about an hour on it and the other was brand spanking new. I was thinking that might have been part of it too. One thing is for sure. It is easier to add bass than to knock it down. My sub works very, very well. It is strong enough to support my HT at levels of 125db so I have lots of flexibility there. With it turned on only one notch from completely off, the room is just audibly filled with the tiny bit of extension the speakers don't seem to be making. On some recordings I have to turn it completely off and on some I turn it up a bit more than halfway. I figure the source and the amp are a lot of that. The room, fortunately seems to need very little treatment. It is 13' x 22' with a set of French doors at the opposite end. With the doors open everything is pretty solid and loud. With the doors closed, the room takes on a different characteristic. Neither is really better than the other, but different. I will play more with the doors closed and the sub off this weekend to see if maybe the room is having more affect than I thought. Now all i have to do is finish the grilles, lol. I broke one during construction and just couldn't wait to have a listen so they sit in the room without for now. Two ideas came to mind regarding the bass - phase of your speakers (are they wired in or out of phase?) and I also think that the location of the bass driver and the resonators is important - per the design, they are much higher in their respective chambers. Perhaps by having set them lower, towards the middle of their chambers as you have them, you reduce a resonant wavelenth within that chamber. I built HDT II's per specification, and there is no issue with too little bass. If I were to use a fostex, I'd try it as open baffle above the enclosure. I actually thought of that yesterday and it made me think about my objectives with these speakers when I originally decided to build them. I have always been a "basshead". Hence the humongous subwoofer in the room. After hearing some of Bob's designs and several others over the last couple of years, I remembered some of the sound off cars I built that had the ability to play quiet sounds and be very pleasing at low volumes and the fact that in that small, near field listening environment, I could always adjust my bass to the music or preference of the listener. That's why I decided to go with the fostex driver. I heard several speakers using it that I really liked. Two or three of those used only that driver. I had enough bass in the room to compensate for any losses the cabinet might experience and I had it tuned low enough to make the towers as low tuned as I could. The one thing I wanted was that effortless ability to reproduce the mid (telephone band?) sound that I liked so much about these other enclosures. I figured if the speaker was lacking at either end, I would be happy so long as I could get that magic that the full rangers seem so good at. I certainly accomplished this so I should be extremely happy. I bet there are a lot of contributing factors to the lack of low extension. I can think of several. The lower mounting of the bass driver in the baffle should likely lower the F3 of the transmission line portion of the box several hz (if not 15 or 20), the extra driver in the cabinet certainly has an effect on the resonance as well (extra cone area and same tl dimensions), The ports in the averaging chamber are effectively, slightly too large due to a mistake in my construction. I could pick it apart all day, but the thing is I love them just the same. THey work perfectly in this room for what my goals were and that's extremely important. I only mention that they are a bit thin in the low extension because I am comparing them to other speakers that I have heard in other rooms. Not exactly fair of me to do that. I can promise that even Bob would likely tell me they sound great in my room. I would bet they don't sound so good in his room though and that is the secret of good design. Flexibility. I think that is why I am so fond of the radials. That is also why my next project is an omni directional monster. I have three drawings on the table. I also have a friend who may want these for her room and if that is the case, I will be sending them her way as soon as I build my next set. My sincerest wish now is that I could make enough money or work in a trade where, I could just play with this stuff as much as I wanted lol. The bottom line is these were designed to give me that mid-range magic of a Fostex design and they accomplished that with flying colors. They just aren't something I would even try to compare to Steve's product and certainly wouldn't try to sell as such. I am certain his sound better in most rooms. Of course, I may have another think after I get a few hundred hours on them lol. We'll have to see about that lol. Edit: Phase was my first thought when I hooked them up. I not only checked it, but even tried playing one speaker at a time to test bass output on it's own. They are definitely in phase. The bass is very sharp with a lot of attack. It is tight and punchy, but just doesn't have a lot of decay or carry in the room. The word I would use is weight. They just seem a little light in the loafers without the sub. This could be my subjective opinion though since I have been listening to the sub for so long. Certain music sounds terrific without it so the problem is extremely small. It's not like they have "NO bass at all" so I am probably being a bit biased after years of listening to car stereos and very loud concerts. Of course, it could be the program material too lol. I just realized I typed all that without taking something into consideration. I always assume that if a speaker doesn't sound as I expected it to that it is my fault and that I made some mistake. The thing here is that I have not yet had the opportunity to test my electronics. That receiver could be wholly responsible for what I am noticing. I will put that to the test this weekend. It will be pretty pleasing to find out it is indeed a weaker link in my chain than something I was responsible for. Of course, there is no dissapointment if this is the case. All it means is a simple swap from my HT system to a Stereo amp system when I want to do extended music listening. And of course there are still room variables. let's see how that works out before I make any changes. I have been hanging out a little more lately and noticed your thread and remember you talking about it. Glad your adaptation worked out well for you. Its strange to me why they do not have the weight to them. Myself being a X basshead it always takes a while to readjust to a set of detailed speakers. Actually I had a bit of an eye opener this morning. I have been listening to my room with these little, cheesy, home theater/ computer speakers for months. I am very accustomed to the sub being a lot louder than the drivers in the rest of the system. I hooked these up last weekend and every time I listened to them was at high volume. I was either watching movies or cranking up some tunes while cleaning the house etc. Probably a good thing for breaking these babies in. This morning I did something completely different. I didn't want to wake the wife and I wanted to sit down and listen to some jazz and lite music for a little while. I forgot that my sub is set up to only play when signal is sent to the amp. Sometimes it doesn't come on at low levels. I flipped a few disks through and listened to some Duke Ellington and was there with my coffee, my eyes closed, thinking "Man this sounds terrific! Everything is where it should be, the tone is perfect, there are sounds in the recording I never realized were there" A few sips later, and a few new songs and I was feeling warm and fuzzy about how good these things were. Then I flipped in a couple of christmas CDs and had the same reaction. My thoughts were of how beautiful the sub was integrating with the speakers. Then I popped in an old Kenny G song and let it play for a while and thought "man, I should turn the sub up just a notch". And so I grabbed my remote and flipped to the sub channel and hit the level button. Just goes to show, a little time in the seat and a little different approach and good things come to those who wait! I am still going to test my other amp in the system and I am going to monkey some, but after this morning, that monkey may be put to the side a lot longer than expected. FWIW, in most systems I've heard, the sub is almost always far too prominent. I realize for HT, etc. that's the desired effect, but it always leaves me feeling like the presentation is seriously unbalanced. As much as it's a bit of a pain sometimes, I'm forever adjusting the output on mine to where it can't really be heard. I like it when the only way you can tell it's on, is by turning it off! Sounds like your new speakers are sounding as good as they look! that's pretty much the idea I got this morning. I turned it down till it was not audible at all and then realized it was off. When I turned it on, boy was it an eye opener. Works terrific for the HT and with some music. I am pretty impressed with these so far. I will try to spend some quality time with them tonight. The wife has agreed to an extended listening session without the TV. Looking pretty good, nice build!!! As far as the bass issues go, might your HT receiver have the speakers set to small. You may have never noticed it with smaller "cheesy" computer speakers. Thanks for the compliment buddy! While you are here let me just say AWESOME job on the new radials. I am so wanting a set of those things now! Had the opportunity to do some deep listening recently and I have some conclusions. These are the best sounding speakers I have ever owned by at least 10,000%. I have done so many car systems with full active XO networks and seriously researched time alignment etc. I even have a full blown system in my Impala right now. It sounds like trash next to these speakers. With the SI amp, they are smooooooooth. I can only imagine what it will be like if I ever get a tube amp going with these things. I have discovered the main difference in full range and multi way speakers and a way to describe it. With the multi way speakers and with the car systems, inevitably, I end up using some sort of sound equalization to adjust the midrange (telephone band) of frequencies to a level that is either even with the lows and highs or to make the speakers listenable. Even if they do a terrific job in this range, it is still this area that needs adjustment to make them sound "right". Once that is done, it is so easy to tell what has been done. You can just "feel" that the mids are either attenuated or boosted to cause the sound you are hearing. With these speakers, everything is set to 0. There is no boost, no attenuation, and no adjustment necessary. With the subwoofer turned completely off, the sound is effortless and open. They just sound "right". Steve said that when listening to a good speaker, other speakers sound broken. I now know what he meant. It took me listening in an A/B environment and swtiching between good and what i used to think was good to understand. call it image, stage, warmth, clarity, flatness, brightness, openness, or anything else you want, it is just a difference in the way you hear the sound. Simple fact is, the full range speakers do something no other speakers do and they do it without being manipulated into it. I will still build more experiments, but I definitely have my own benchmark for my room now. Thanks for the plans and all the advice to everyone at DecWare. Thanks especially to Bob for putting up with me! Robert, your comments are inspiring to those of us considering the same thing-building speakers. mahalo! I have to admit, if I were to do this again, I believe I would build the MKII version exactly by the plans. Other than that, I am pleased to say it is inspiring to know how good they can sound. I have played a lot with them over the weekend and even my wife found herself sitting there just listening. Good luck with whatever project you choose Mike! When you built your HDT II's did you find the single plate loaded the TL ideally? The Fostex HDT uses a single plate and the Silver Flute uses 2 plates. I am wondering how finicky the Silver Flute is to being loaded to produce bass. If I can get away from having to use 2 plates and put the Swan's tweeter floating above the single plate it would make construction easier. The dual plate setup on the MK II's is an imaging enhancement and a bass enhancement. Even the regular HDT would probably sound better with the dual plate system. In the dual plate system, the first plate is screwed to the cabinet through spikes. You can lift the entire cabinet by it. It has a hole with 1/3rd the area of the transmission line below it. The second plate is then floating above the first on spikes and is pinned tuned to the first plate with a single bolt in the center. Adjusting the tension on the bolt actually tunes the plates. 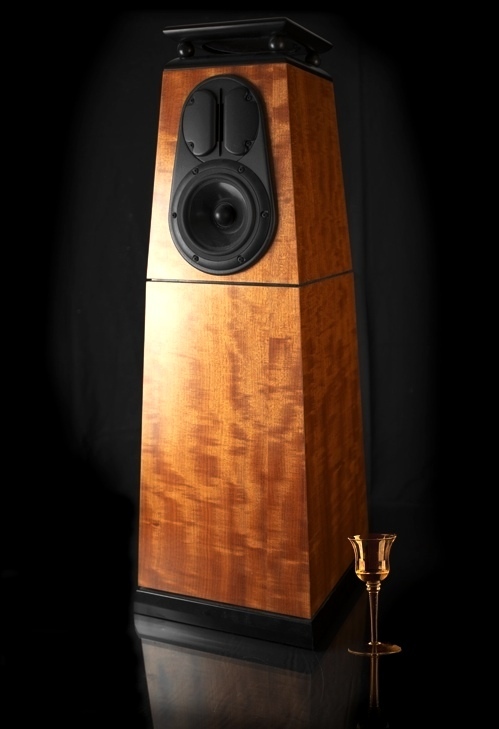 The tension works with the cabinet resonance to cancel each other out resulting in much tighter bass. It's a good thing I'm not smart because my speaker designs might become complicated. Steve, I agonized over this when I built my HDTs which I just recently finished (or so I thought). I now want to reconfig the plates. I used Aqatec marine ply for the boxes which is quite dense and my plates are solid wenge, a hard and very dense and musical wood. I have enough 13 1/2" wide solids to add this second plate and now must follow through. I really need to get them out of the shop and back in system. Thanks for the push. I haven't been here in a long time and didn't even know anyone had checked the thread. I opted for the single plate on mine simply because I felt the build was complex enough for my abilities. To be honest, I found it to be a bit beyond my abilities to do correctly, but I was, and still am, extremely pleased with the results. Curious to see the plates. I made single plates that rest on top. I built the HDT's when they were first published, switched over to the MkII drivers. I missed that single full range sound and had decware bring my 206's up to date. So today I'm implementing the Alternate tuning setup.